When Shikha Desai turned 17, she lost her vision. She is one of Georgia State’s nine reported students living with blindness, according to Saretha Pyant, Disabilities Services assistive technology coordinator. Even though she has retinitis pigmentosa, which is the disease that robbed her of her sight, she still listens to music with friends, sits through her women’s studies lectures and enjoys the sounds and smells of the city like many Georgia State students. Desai said the university accommodates her through the Office of Disabilities, but there is still room for improvement. This academic year, Desai moved from her parent’s house to the University Lofts to gain independence and to meet new people. Since then, her mobility coach, provided by the university, has shown her to her dorm and bus stops. 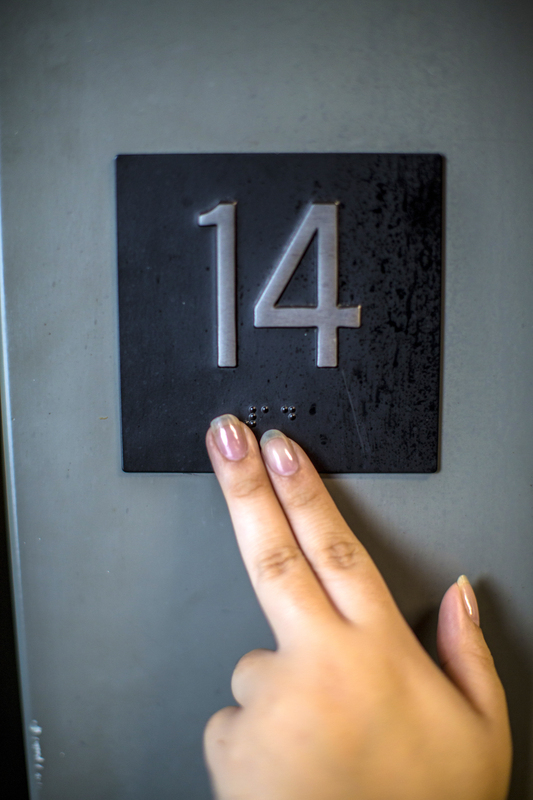 “There’s braille on my door, and there’s braille on the elevator too. But it doesn’t talk. So, I just get out a little bit, and I just feel the sign on the side to see what floor I am getting off,” she said. To make daily activities easier, Desai said braille should be added to bus stops. In the Center for the Visually Impaired, she said there is a vending machine she can access, unlike the ones on campus. Desai said the chirping in intersections makes her feel comfortable when crossing Atlanta’s intersections, but she usually relies on the sound of parallel traffic to guide her. Judith Emerson, Georgia State professor and advisor for ABLE, a student organization for disability advocacy, said more chirping crosswalks, like the ones at Gilmer and Central intersection and Gilmer and Courtland intersection, should be added throughout campus as well. “If you ever notice that when you travel those intersections and you hear that chirping noise, that is at the benefit of people who have visual impairment,” she said. She said the cracked and disintegrating sidewalks on campus should be maintained, because it can be dangerous for pedestrians with or without visual impairments. Emerson said elevators should have an added voice feature. Desai said she utilizes the Office of Disabilities’ talking computers, voice memo on her phone and braille note taker. Additional resources are offered to students with blindness, which include converting textbooks and documents into braille, electronic text or audio files, according to Pyant. “A student has the option to hire a note taker whom will be compensated through the office of disability services,” she said. The Office of Disability Services also offers screen-reader software, double-time on tests and priority seating. “However, academic accommodations are determined on a case by case basis,” she said. Pyant said students who are blind should prepare before attending Georgia State by registering with the Office of Disability to form an accommodation plan, and she recommends for them to use priority registration to reserve alternative media in advance. She said she chose Georgia State to step outside of her comfort zone. Desai is active on campus through being in the social work club and chorus. But she has never heard about ABLE and wants to join to meet other students living with disabilities. Emerson said there are currently no registered students with visual impairment in ABLE, but anyone is welcome to join. Emerson, who teaches for Georgia State’s College of Education & Human Development, said she hopes the student body is accepting and understanding to those with disabilities. “Often times people don’t know that a person is blind on the street. They might want to help that person, but that person might be independent enough to not need anyone’s help,” she said. Lauren, it is an eye opening article. who can write better than one who is going through blindness. It reminds me of movie ‘wait until dark’ starring Audrey Hepburn. Georgia University should have more programs like swimming, hiking, and karaoke to bring joy, happiness and awareness of social environment. Many blind students have amazing gift of listening, feeling its surroundings and keen sense of observing things around them without seeing them.